And what would it be without a parade? 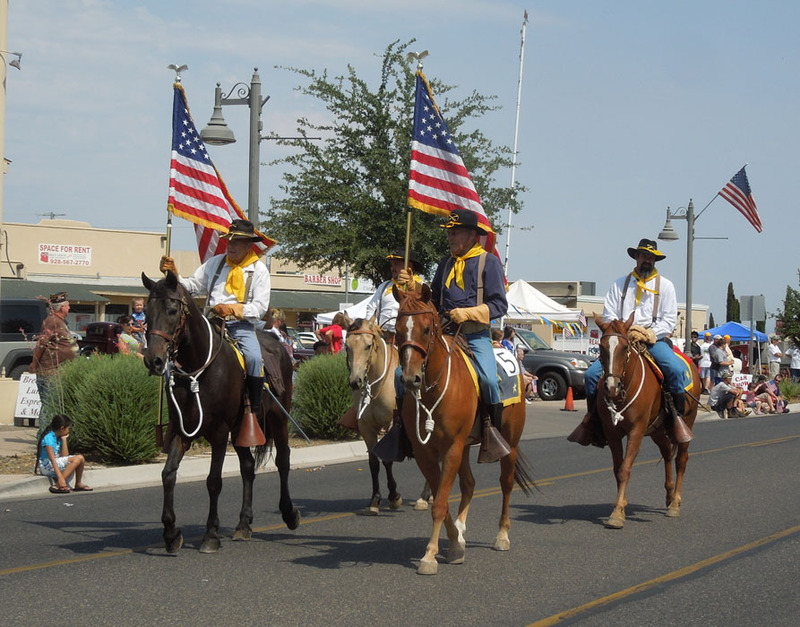 And what is a parade without horses? I strolled - well, drove - over to Camp Verde to enjoy their local parade because I knew a few people who were going to be in the parade. Um... no, I don't know the guys on the horses. But I do know these people. It's the Camp Verde Library float! 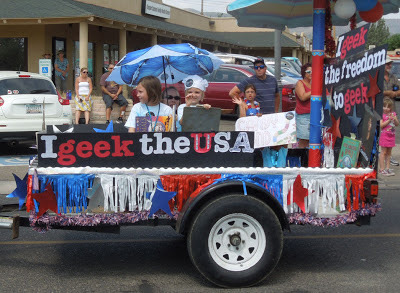 Their theme was "I geek...." - See - "I geek the USA" and "I geek the freedom to geek". And, of course, you can find out everything you need to know about what you geek at the Library. I love small towns. Nobody thinks your nuts if you point out your grandchildren in a parade. Mikayla geeks reading, Naomi geeks cooking, and Sophia (behind her big sign) geeks Candyland. Cynthia, behind the herd of geek-ers also geeks reading. Timothy and Jubilee have their own little stroller float behind the big float. He geeks Greek. In fact he geeks it so much that he teaches it! I'm not sure, but I think Jubilee geeks naps. Or lunch. Or both. So how did they all end up in the parade? Well, Timothy's mother is the manager of the Camp Verde library. She came up with this cool idea for the float and invited the family to come join the fun. Brilliant idea! Her name is Kathy, too. Her husband, Kent, was the chauffer for the gala event - and I'll stop the list of people at that point because one of us is going to get lost if I try to name all the names. Needless to say, the kiddos stole the show! There were other floats, too - but not two hours like the Rose Bowl and none of us had to camp out all night for a good seat either. Yay! We all had a good time, too - chatting and laughing about little town parades and how fun they are. And we were all heading home before it got too hot to be fun. 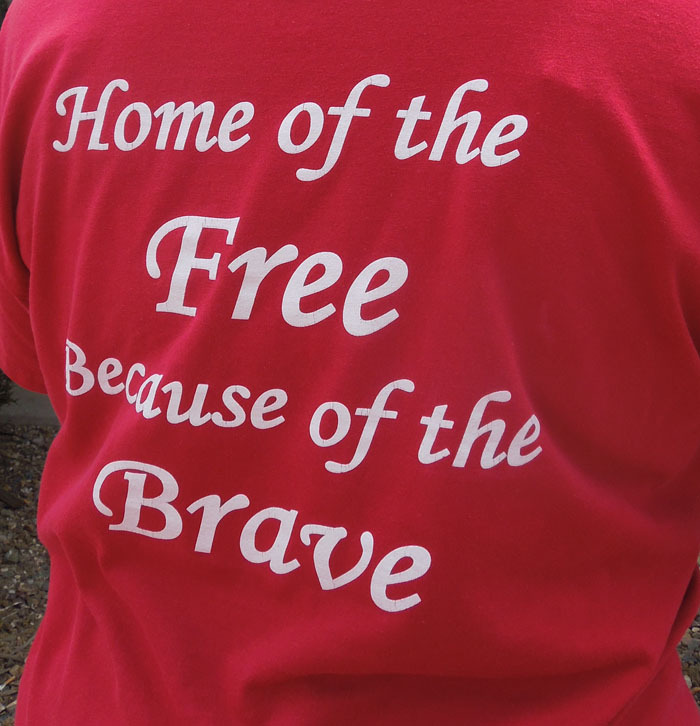 There were a few good reminders, too, of what Independence Day is all about. ...and a reminder of the brave firefighters who lost their lives recently. 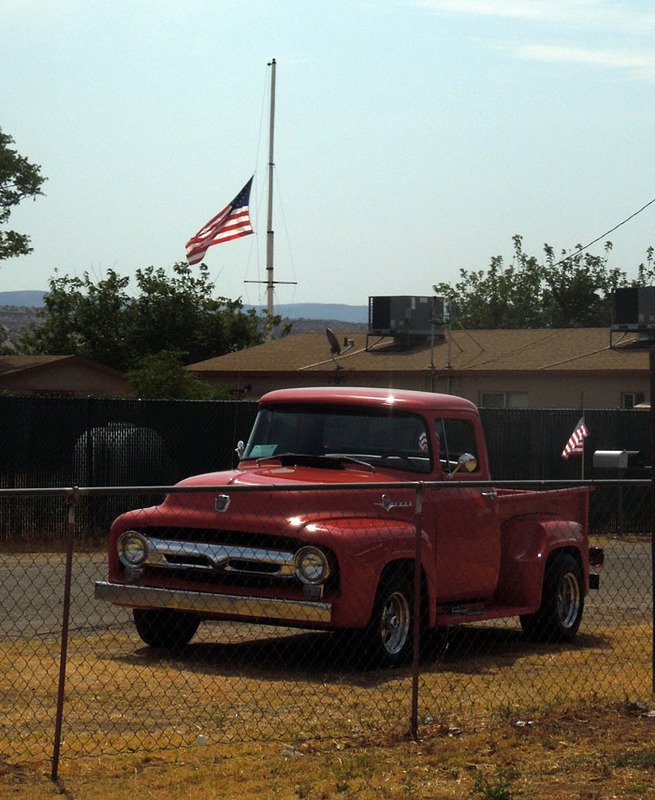 The flags are at half staff to honor them. 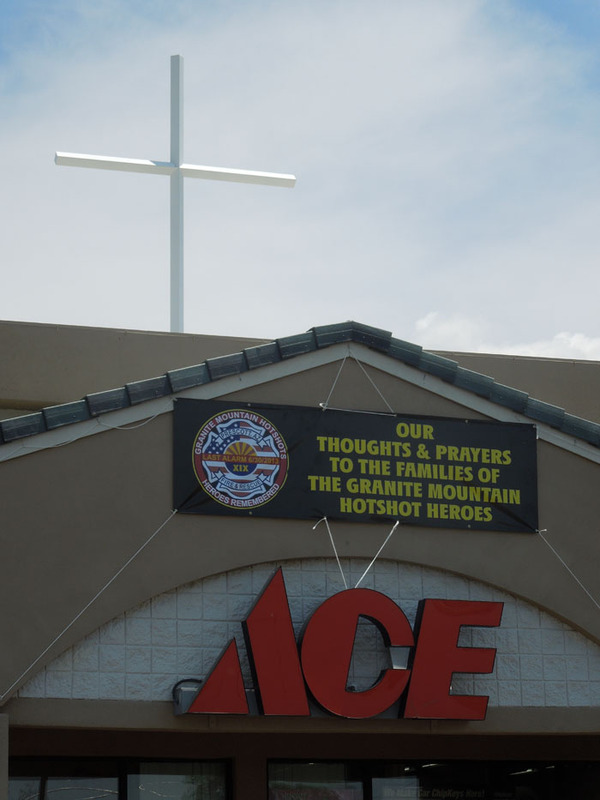 Back in Chino Valley, the Ace Hardware put up a sign. Hope you had a great Independence Day. Fun Times had by all it seems. Love the truck! My dad has a '50 Chevy that looks very similar. His is maroon. They had a lot of fun! 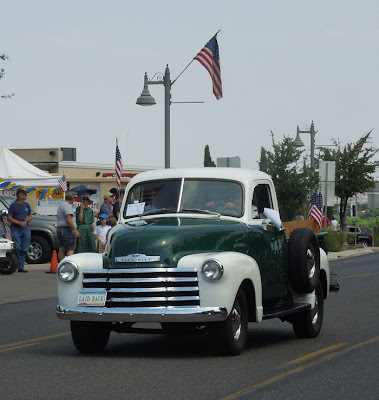 How fun - classic trucks are so neat. Thanks for taking me to the parade :D Great float and adorable girls...will check again in a bit to see if Sophia lowers her sign. Thanks for visiting! It was fun - though the preparation took a lot longer than the parade. LOL - but that's part of the small town fun, too. Very entertaining! We didn't catch a parade this year, but we did enjoy a tasty meal at 50% off at a place generously offering a discount to military folks! Yay! Nice to see business supporting our military. Hope you had a wonderful time. I geek that library float! How cute! 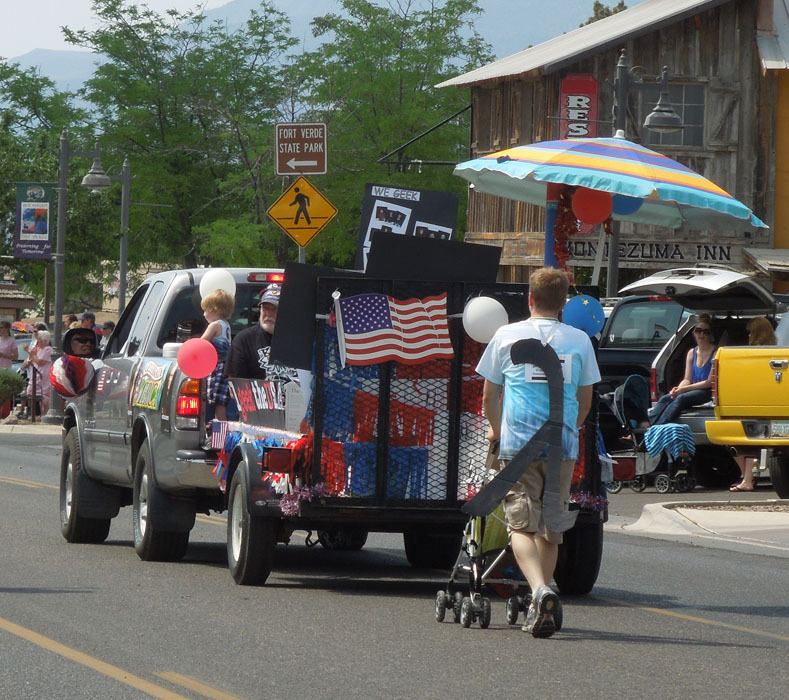 Small town parades are such fun. Thanks! It was fun to watch the parade. There were lots of young ones participating. If not the only float, certainly the most important float! Thanks, Kath! Two cool old trucks in one post - you are indeed a good friend! We have been flying our flag at half staff also. We have so many friends who are first responders, and it just is amazing too sad when we lose one, much less nineteen. The GrandGeeks are too cute on their float! LOL - When I saw the green truck I knew I had to take a photo and post it on my blog for you! The memorial service today was very moving. They all had a lot of fun! Most of the cousins were in the pickup towing the trailer. A real family event! Looks like a fun parade, I bet the kids really enjoyed it! Love the red t-shirt... home of the free, because of the brave! They did have a lot of fun! I sure had fun taking pictures. I liked the t-shirt, too. Glad that the lady didn't mind me taking her picture.